This page assumes that you have downloaded a binary Toast++ package, or have compiled the Toast++ components from sources. For details, please refer to the source or binary download pages. To install Toast++ from a binary distribution, you need to download the Common package, containing the platform-independent scripts, data files and documentation files, and the appropriate Windows binary package, containing the compiled libraries and executables. Unzip both into the same directory. Make sure that your unzip tool preserves the directory structure of the archive file. This will create a subdirectory 'toast' in your current working directory, containing the toast binary installation tree. If you want to compile Toast++ yourself instead, you need MS Visual Studio 2005 or newer. 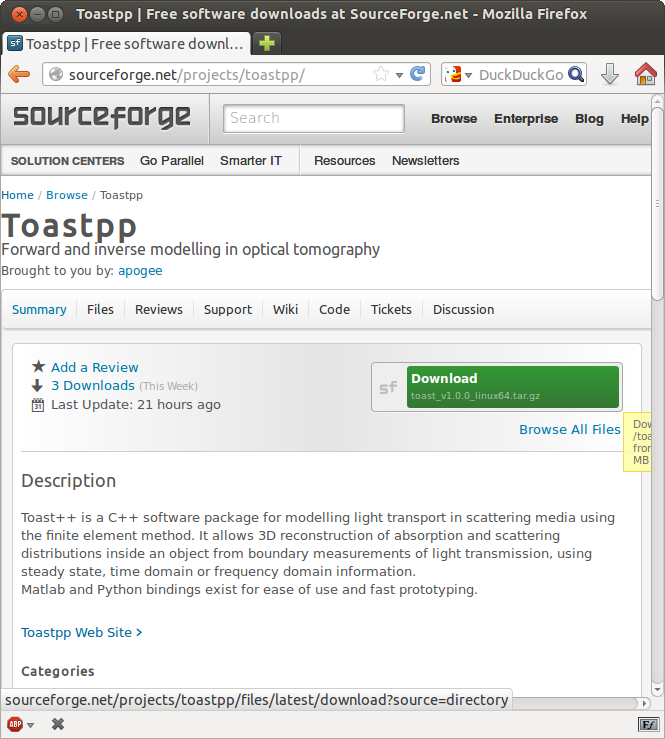 Check out a copy of the Toast++ sources from the SVN repository, and compile it as described on the Download page. To add the Toast-Matlab toolbox to your Matlab environment, you need to set the paths for the Matlab scripts and mex files. Start Matlab; on the Matlab prompt, change the working directory to the Toast root directory, and run the mtoast_install script. This will add the required directories to your Matlab path. It will open a dialog box for you to confirm the new paths. Click 'Save' to store the paths permanently. To install Toast++ from a binary distribution, you need to download the Common package, containing the platform-independent scripts, data files and documentation files, and the appropriate Linux binary package, containing the compiled libraries and executables. Unzip/untar both into the same directory. Make sure that your extraction tools preserve the directory structure of the archive files. If you want to compile Toast++ yourself instead, you need a recent version of the gcc/g++/gfortran compiler family. (But if you want to compile the mex files for the Matlab toolbox, be aware that your compiler version must be compatible with your version of Matlab. See Mathwork's Supported Compilers page for details.) 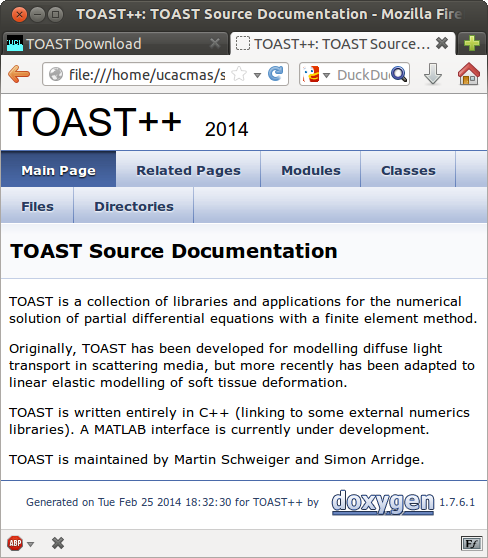 Check out a copy of the Toast++ sources from the SVN repository, and compile it as described on the Download page. (Replace '$HOME/toast' with the appropriate path to the toast root directory of your installation, if required). For convenience, you should add these two lines to your .cshrc or .bashrc shell initialisation script, so you don't have to type them for each new session.